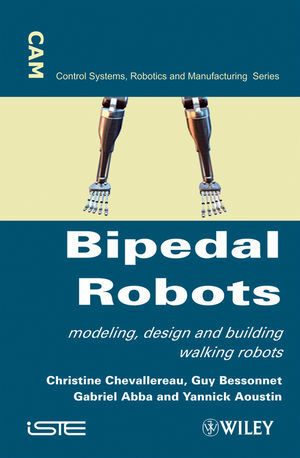 This book presents various techniques to carry out the gait modeling, the gait patterns synthesis, and the control of biped robots. Some general information on the human walking, a presentation of the current experimental biped robots, and the application of walking bipeds are given. The modeling is based on the decomposition on a walking step into different sub-phases depending on the way each foot stands into contact on the ground. The robot design is dealt with according to the mass repartition and the choice of the actuators. Different ways to generate walking patterns are considered, such as passive walking and gait synthesis performed using optimization technique. Control based on the robot modeling, neural network methods, or intuitive approaches are presented. The unilaterality of contact is dealt with using on-line adaptation of the desired motion. Christine Chevallereau is the author of Bipedal Robots: Modeling, Design and Walking Synthesis, published by Wiley. Guy Bessonnet is the author of Bipedal Robots: Modeling, Design and Walking Synthesis, published by Wiley. Gabriel Abba is the author of Bipedal Robots: Modeling, Design and Walking Synthesis, published by Wiley. Yannick Aoustin is the author of Bipedal Robots: Modeling, Design and Walking Synthesis, published by Wiley.